Intentional provocation and anti-art – the Dada movement opposed all norms of bourgeois culture and nationalism through its shock tactics. How relevant is Dada today, 100 years later? A search for evidence between Weimar and Hanover. Springtime in Weimar. During the finissage of the Weimar Dada Anniversary exhibition held In the gallery C-Keller, where dissidents used to meet in the GDR era, women singers of the Absurde Chor sung “Am Anfang war der Ort, dann kam das Wort, jetzt sind wir dort“ (In the beginning was the place, then came the word and now we are there) under the leadership of their choral conductor, Michael von Hintzenstern. Trained as a church musician Hintzenstern discovered Dada at the beginning of the nineteen eighties and his presentation of Kurt Schwitters’ famous phonetic poem “Ursonate“ caused quite a stir in the socialist culture scene of Classical Weimar. To underscore the importance of the “place“ Weimar during the early stages of the Dada movement, there was also a showcase displaying different odds and ends that are claimed to have belonged to Dada greats. These items include a foot powder box that belonged to the sound poet Kurt Schwitters, a soap dish of Hannah Höch, one of the inventors of the collage, and an elegant ladies glove that is claimed to have belonged to Nelly van Doesburg. She and her husband, the architect Theo von Doesburg, came to Weimar in 1921. Doesburg was supposed to be teaching at the Bauhaus on the “de Stijl“ reform movement, but his primary interest was in the wild Dadaists who, in the middle of the First World War, had proclaimed an art revolution in neutral Switzerland a few years earlier. “I have scattered the poison of the new spirit everywhere” he wrote to a friend. And Doesburg was not the only Dada poison mixer in Weimar at that time: Tristan Tzara from Zurich and Kurt Schwitters from Hanover came to attend the first joint congress of Constructivists and Dadaists. They all spent the day drinking heavily and then gathered in the evening for the soiree in Hotel Fürstenhof. 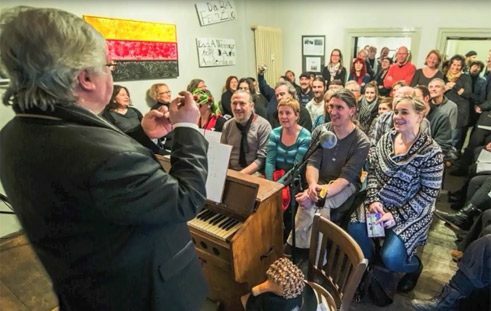 The artistically oriented Weimar audience showed a very adverse reaction to the texts presented as a seemingly random composition of syllables and atonal sound sequences. For the Dadaists, says art historian Michael Lütthi, anything could be turned into art: a newspaper clipping, a shop window dummy, a porcelain urinal. But Weimar is just one of many places where “new art” was proclaimed and lived. The Absurd Chorus in Weimar conducted by Michael of Hintzenstern “In the beginning was the Word” and Dada relics at Weimar: foot powder of Kurt Schwitters next to the soap dish of Hanna Höch (Photos: M. Schuck). After the First World War, Dada spread from Zurich across the world. After Weimar, Berlin became the centre of the Dada movement in Germany. This was not only due to the first “Dada Messe”, the first exhibition organised by Dadaists, being held here in two back rooms in 1920, but also because one of the very few female Dadaists was working in Berlin: Hannah Höch. When the Nazis banned her work, declaring it as “entartet” or “degenerate” art, Höch withdrew to her garden house on the outskirts of the city. Here she lived a secluded life, and was almost forgotten until she was rediscovered by a local journalist. Already in her seventies, Hanah Höch was then appointed as a member of Berlin’s Akademie der Künste (Academy of Arts). Her collages are on show in the MOMA in New York. “This late fame was like an accolade to her”, comments painter Johannes Bauersachs. Today he lives with his family in Höch’s garden house, where he looks after the enchanted garden that is rather like a three-dimensional Dada collage in green: box hedges cut at oblique angles, circular vegetable patches, pergolas designed in the form of a labyrinth. 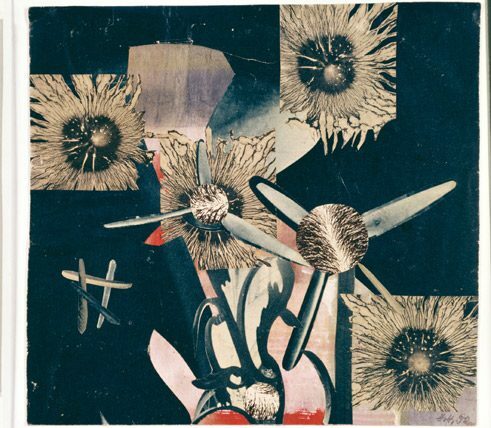 Hannah Höch, Synthetische Blumen, 1952, Collage | © Berliner Sparkasse, © VG Bild-Kunst, Bonn 2016 A few tram stops further down the road the Dadaist view of the world is firmly established in the curriculum for high school students. Every pupil in the fourth grade at the Kurt-Schwitters-Gymnasium is given a booklet that contains Schwitters’ biography and his famous nonsense lyrics. Eleven year-old Clara likes Schwitters’ i-Gedicht best: “lies: rauf, runter, rauf, Pünktchen drauf“ (read :Up, down, up – dot on top), she recites proudly. And how does she explain Dada? “ I think they did a lot of nonsense things when they met up, to show the terrible nonsense that goes on in the world – nonsense like wars…”. And today? “Today there is still a lot of nonsense around”, Clara adds. Nonsense against nonsense – an art historian couldn’t explain Dada in any better words. 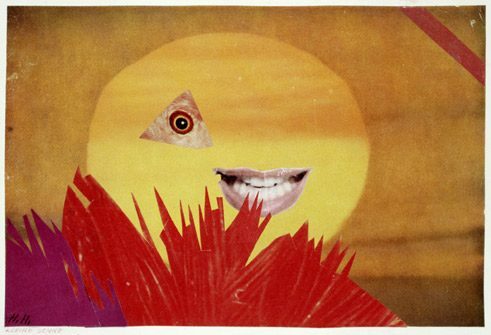 Hannah Höch (1889–1978) is considered one of the most significant female German artists of the Classical Modern period. There is a comprehensive catalogue on the exhibition in the Kunsthalle-Mannheim (22.04.2016–14.08.2016) showing her work after 1945. Gerd Brendel lives in Berlin and works as a free-lance radio journalist and author for Deutschlandradio Kultur and other public broadcasting radio programmes. He practices his passion for Dadaism in Küchenradio , a podcast that he launched with other colleagues some years ago.